I love it when posts are inspired by a reader question, and this question is from my Facebook Page. 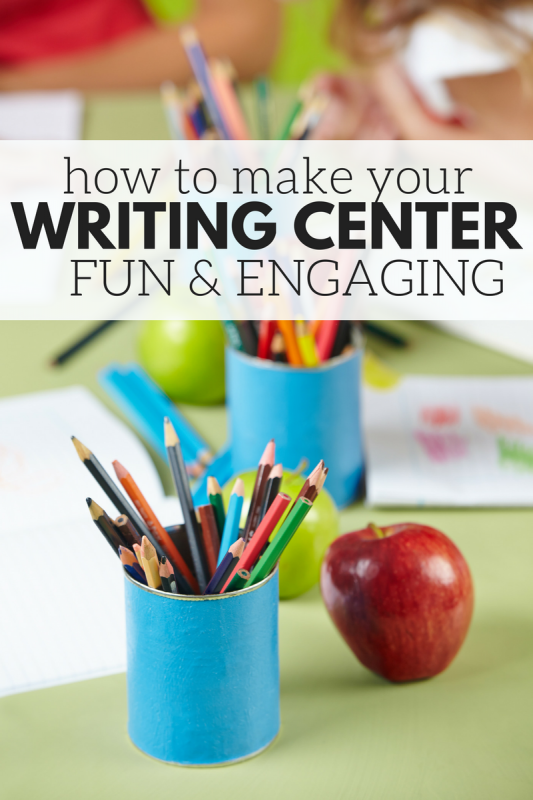 A preschool teacher asked for tips on keeping her writing center fun and engaging. 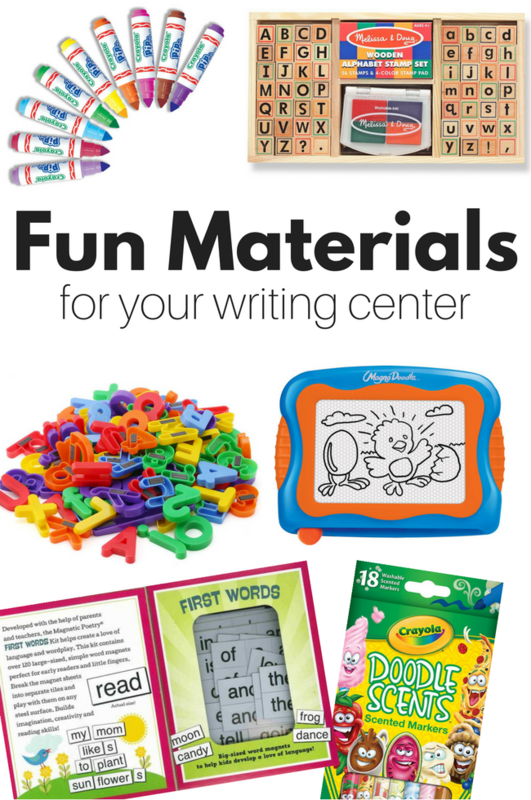 I love writing centers and have included them in my classrooms from age 2 and up. When you provide the right materials and invitations to learn the children will gravitate towards it and engage. Here are my writing center tips! 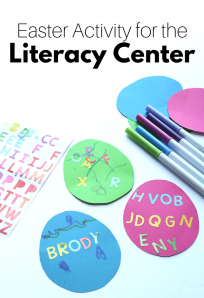 Classroom Placement – Every classroom is different, but the writing center should be placed somewhere where there is some traffic so that even if the children aren’t planning on going to it, they may pass by and decide to stay. Awesome Materials. Materials that act as bait. Fun pencils, shiny stickers, colorful envelopes! Cookie sheets and letter magnets or for older children even word magnets are a fun option too. See below for a list of my favorites. The Right Tools – Use tools that are at your students developmental level. 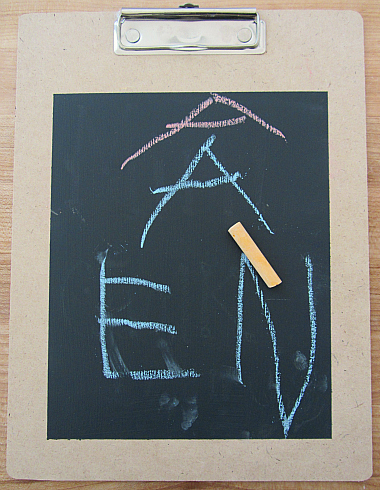 Chubby pencils and crayons for toddler’s hands, small clipboards they can manage, kid-sized chalkboards, and notepads. Relevant Print – Include your students and their families in the center with photos of them with their names underneath, include other labeled photos that are relevant like photos of the school, your town, and other fun places they might want to write or draw about. If you are doing one of the suggested, pretend play themes have relevant words written out on a small board or laminated cards. You don’t need many, we want the children to make their marks and use developmental spelling, but we want just a few to entice them to try. 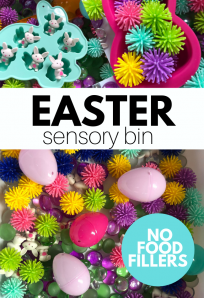 Slip in Sensory Play. Writing doesn’t have to be on paper. Use writing trays with sensory materials such as salt or sand. 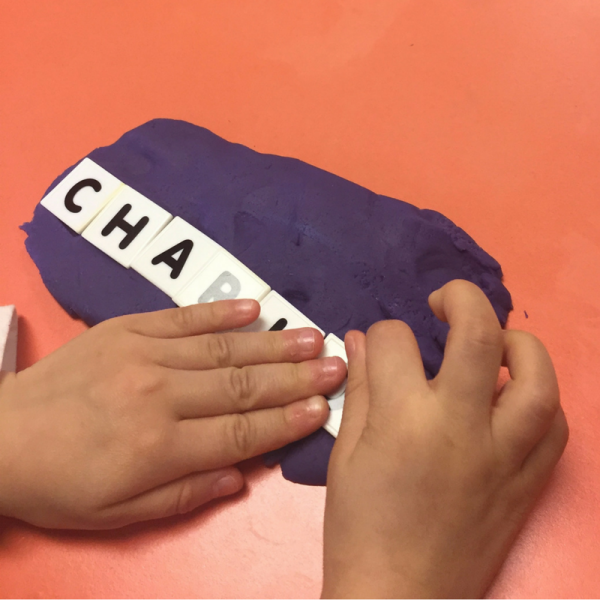 Include play dough and letter stamps or tiles to make messages, even slime! Use Journals – Preschool journals are great, and this post has wonderful developmentally appropriate ways to use them. 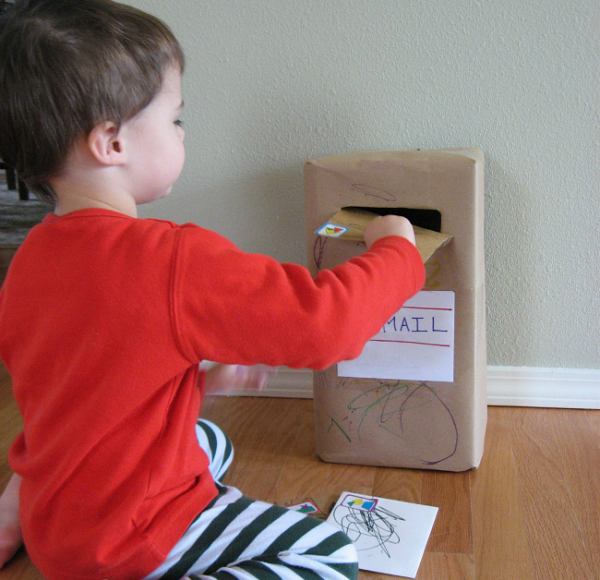 Post Office – include a mailbox ( click to see how I make them for my class), envelopes, an address book or laminated address cards with addresses written in, and stickers. Birthday Cards – pop a birthday crown on a stuffed animal or a birthday banner on your rabbit cage and invite the children to write birthday cards to the stuffed animals or pet. Have birthday cards and envelopes ready, maybe some confetti to add in too. I like to use special pens for this one like glitter pens or smelly markers! Warm Fuzzies – these are little notes to make people feel warm and fuzzy. Of all places, I actually got this idea from my college sorority. Hey, inspiration comes from all over. Sticky notes are a great material for this in various colors, and students can draw or write happy notes to each other, their parents, or staff. Bright pens and happy face stickers are a must. When setting this center up make a bunch of warm fuzzies to start with, some with drawings and others with sayings like “Great job!” “Smile!” etc… remember writing centers aren’t just for getting kids to write as much as possible they are also teaching children that writing has meaning and can convey messages. Classroom Newspaper – you can get spiral notebooks, reporter ID tags, and even some old laptops to “type” on. Students also love glasses without lense in them to make them look like serious journalists. 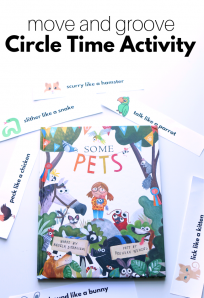 Book Reviews – this is informal but fun, include a book or two that the children are familiar with and invite them to draw pictures or write something about that book. If the book has characters that are available as stickers ( Eric Carle books, some Mo Willems, Seuss…) add those to the mix as well. They can be used for the child’s creation. Holiday Themes if your classroom participates in these holidays- Christmas cards, Valentine’s, Halloween Cards, Easter Cards. Add in fun holiday themed stickers and pencils too. Don’t forget you can also re-cover your mailbox in various wrapping paper to fit the theme. Remember to rotate these materials using novelty and to tie in topics and themes you might be learning about to make the center that much more relevant and engaging. Fun pens like these, these, and these! Chunky pencils, markers, and crayons for little hands. Also, crayon rocks are wonderful! Magnadoodles – big and little ones. Fun trays for holding cards, paper, and tools. After all these tips and links to great materials, the best thing any teacher can do is to connect with their students and find out what they love to play with and find ways to incorporate that into every aspect of learning in the classroom. It’s amazing how just having the right color of an envelope ( it’s always purple in my classrooms), can make writing that letter that much more enticing.